Imagine being trapped in your own mind, knowing what you want to say, but just not knowing how to say it. Imagine having had a stroke or living with dementia, unable to make your needs known or express your feelings. This incredibly simple solution came to be after someone contacted me asking for if I knew of a communication tool for a lady she was helping care for. The lady was Chinese and sadly through dementia had forgotten her English and was only able to speak her native tongue, which none of the carers could understand or reply to her in. This was obviously distressing for all concerned. There are lots of communication ideas on the market, flash card pictures on key rings, booklets, Velcro tiles you stick on mats, etc, etc – but I wanted something incredibly simple and designed these sheets using only the most commonly needed or wanted items and feelings felt. I gave them away free of charge and had hundreds and hundreds of orders. The feedback was phenomenal, they worked! 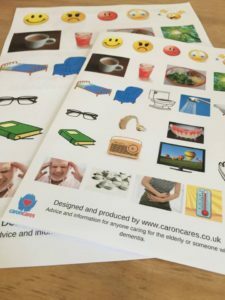 They did the job they were designed to do and alleviated stress and anxiety in older people who had lost the ability to speak. 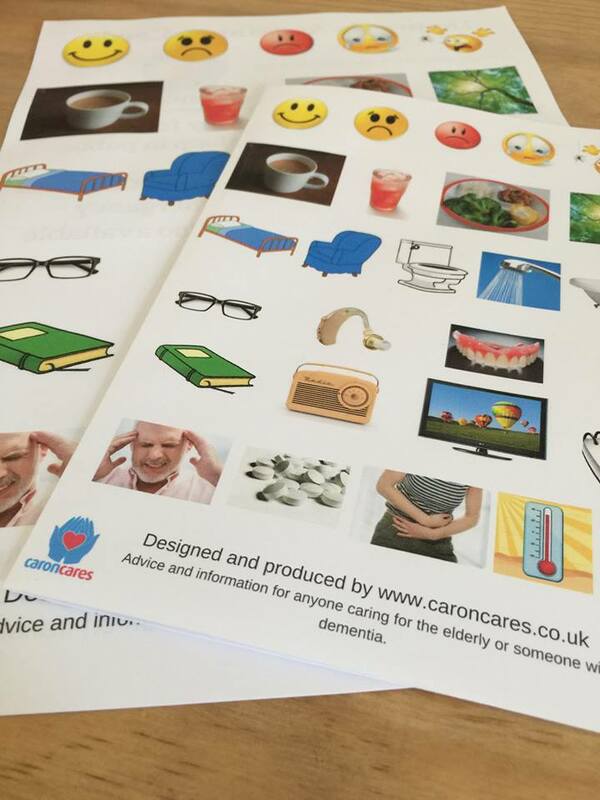 I then designed a second sheet for younger people as not everyone who has problems communicating is elderly, no need for false teeth, walking stick or hearing aid pictures! These I replaced with images of a mobile phone, tablet device, makeup, and a toothbrush! I then made both designs available in 3 sizes, A4, A5 and to wear on a lanyard, A6.